Take on a rapid-fire onslaught of challenges and mash-ups from 16 of Nintendo’s finest 8-bit games! Test your skills on a gauntlet of quick tricky challenges and remix stages that combine parts of different games. Link™ vs. Donkey Kong™! Kirby™ vs. Boo™! 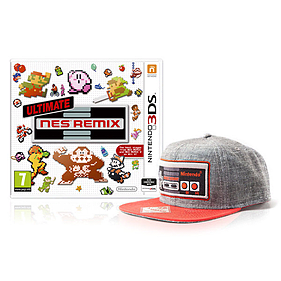 It’s mash-up mania in this celebration of all things NES™! Race through to earn stars on increasingly tough tasks, like beating Ridley from Metroid™ or making Princess Peach™ save herself! Compete in Championship Mode’s blitz of challenges from the Super Mario Bros., Super Mario Bros.™ 3, and Dr. Mario™ games, then compare scores with others in your region via online leaderboards. 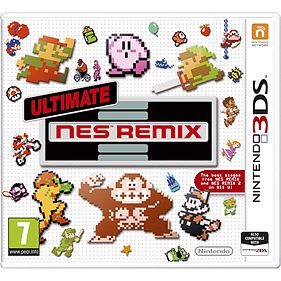 Features action-packed challenges from 16 classic 8-bit Nintendo games.Dominate exciting chunks of retro Nintendo games from NES™ Remix, such as Super Mario Bros.™, The Legend of Zelda™, Excitebike™ and Donkey Kong™.Challenges from NES™ Remix 2 include bite-sized chunks of Super Mario Bros.™ 3, Zelda II- The Adventure of Link™, Metroid™, Kid Icarus™, and Kirby’s Adventure™ among many others. Test your skills in a series of altered 8-bit challenges and improve your times to unlock more challenges!Take on 3 unique challenges from the Nintendo World Championships and Nintendo Campus Challenge, then check your score on online leaderboards to see how you stack up.